From the moment our Pinot Noir and Chardonnay grapes are brought into the winery, all procedures are carefully orchestrated to ensure pristine fruit condition and optimum flavor integrity. At every step of the winemaking process we scrupulously keep individual vineyard lots separate for complete terroir transparency. Every vintage our winemaking team shepherds up to 250 micro-cru fermentations, keeping individual vineyard blocks isolated and distinct throughout the process. Our facility was designed with abundant space to allow for the over-vintaging of all of our wines. This luxury of space allows us to house all the equipment and diversity of fermenter tanks necessary to give each varietal and micro-cru the precision treatment it requires. It also lets us take more time to fully settle our wines after fermentation, without rushing to free up space for new arrivals. Domaine Serene’s extensive barrel program further supports our commitment to terroir transparency and the art of blending. We work with a variety of different French coopers to achieve stylistic diversity which supports our quality goals. We hand-select barrels representing a wide range of sizes, oak forests and toast levels, and are even working with coopers to create a series of custom barrels exclusive to Domaine Serene. Along with meticulous yeast selection and comprehensive micro-cru fermentation management, this intricate barrel program contributes yet another layer of complexity to our wines. The art of blending is the hallmark of the Domaine Serene winemaking philosophy. Our winemaking team consistently tastes many different lots throughout the barrel-aging process to determine ideal blends for our Evenstad Reserve, Yamhill Cuvée, Prestige and Single Vineyard wines. Meticulous blending from selected barrels allows our team to craft elegant, balanced and silky wines year after year. After bottling, each individual wine is aged in the perfect environment until Ken, Grace and our winemakers are satisfied it is ready for release. There is no set market release schedule based on commercial demands, and our wines are bottle-aged at the winery for a minimum of 1-2 years before we offer them for sale. Because of this cost intensive, disciplined approach, Domaine Serene wines are ready to drink upon release, but will continue to reward additional aging of 20+ years for Pinot Noir and 10+ years for Chardonnay with proper cellaring. 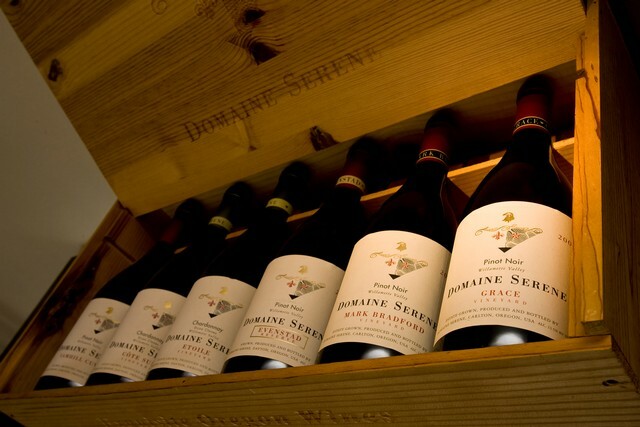 The art of blending is the hallmark of Domaine Serene’s winemaking philosophy. The signature silky style and smooth texture of our wines is no accident, and is achieved in the winery through an artful, yet scientific approach that takes winemaking precision to an uncommon level. A meticulous approach to vineyard management utilizes dry-farming and sustainable practices along with carefully managed yields to coax the optimal flavor and balance from the vines. Each block is handled separately for complete terroir transparency. From rigorous hand sorting, through as many as 250 micro-cru fermentations each vintage, to a diverse extended barrel-aging program, our estate vineyard sites are kept separate throughout the winemaking process until they are artfully assembled in the final cuvée before bottling. Each individual barrel is carefully assessed throughout the year, with multiple trial blends developed, to ultimately determine ideal final blends that deliver against the stylistic goals of the wines we create. Once bottled, the rare luxury of space in our winery allows for extended bottle aging of a minimum of 1-2 years for Pinot Noir. This ensures flavors are well integrated and ready to be enjoyed upon release. 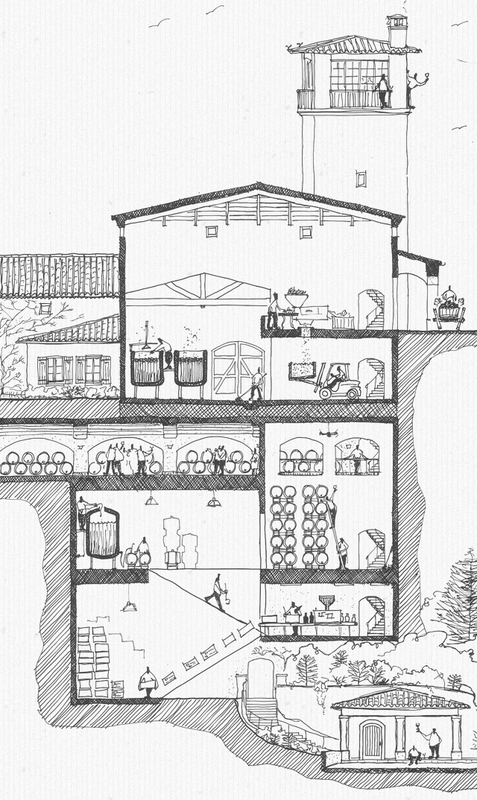 Our five-level winery is designed to use gravity flow for moving wine from one stage of the winemaking process to the next, a time-tested approach for transferring wine gently to help preserve its pure terroir expression. 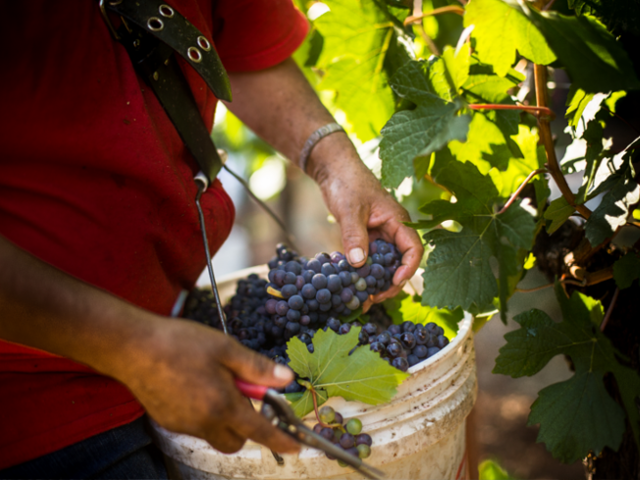 At Domaine Serene, our approach to quality starts in the vineyard. Our six dry-farmed vineyard estates are all LIVE certified sustainable and deliver extremely low yields, and represent a diverse array of microclimates, elevations, exposures and soil types. Clonal selection for both Chardonnay and Pinot Noir is site-specific: selecting the perfect clone and rootstock combination for individual blocks within each of our vineyard estates is critical. 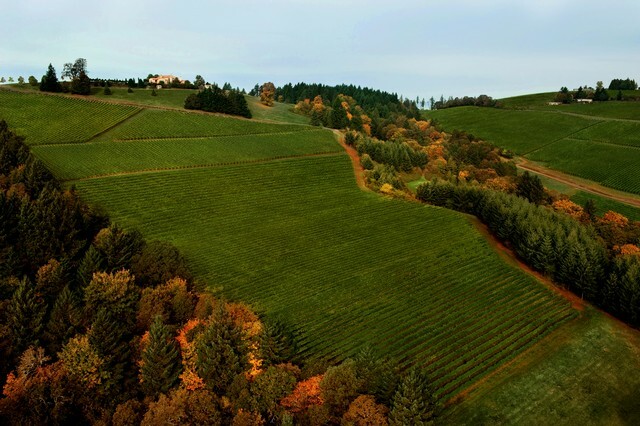 Additionally, Domaine Serene owns some of Oregon’s oldest Dijon clone Chardonnay vineyards, all of which are planted on volcanic Jory soils at high elevations and result in Chardonnays of stunning balance and complexity. At harvest, each distinct block of vines is handpicked and kept separate in small bins to maintain pristine fruit condition, and are carefully marked to indicate site sourcing. Grapes that are fresh, cool and unbruised are much less susceptible to oxidation, so Domaine Serene typically harvests in early morning when the fruit is still naturally chilled. We use quarter-ton bins – about half industry-standard size – to limit cumulative weight that can smash the whole berries. Upon arrival at the winery, the newly picked fruit is staged in a cool space adjacent to the receiving doorway. A team of 6-8 skilled sorters quickly remove unwanted leaves and other material from the grape clusters on a sorting table, which moves the fruit along in front of them as they work. 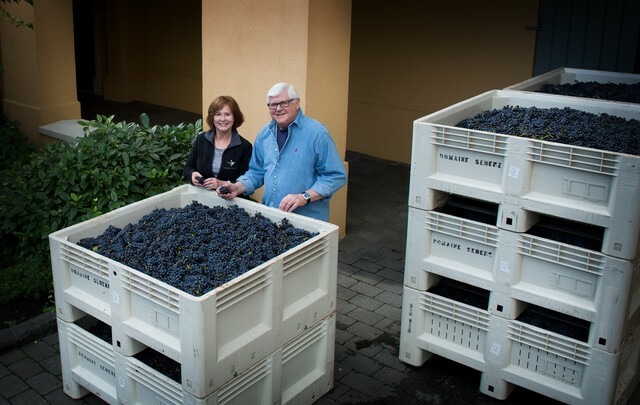 Both Grace and Ken Evenstad can often be found manning the sorting table during harvest. Grape clusters are gently destemmed and the whole berries slide down to the fermentation level, minimizing bruising as they are delivered to the open-top fermenter one story below. There they are cooled with dry ice to begin the gentle aqueous extraction phase that Ken Evenstad pioneered in Oregon in the early 1990’s. Grace Evenstad likes to say, “Pinot Noir is the princess of all grapes: it knows everything you’ve done to it and always remembers.” With this in mind, our many thoughtful design elements make it possible to gently and efficiently deliver whole, intact berries from bin to tank, in excellent condition and well prepared for the next stage in their transformation to world-class wine. 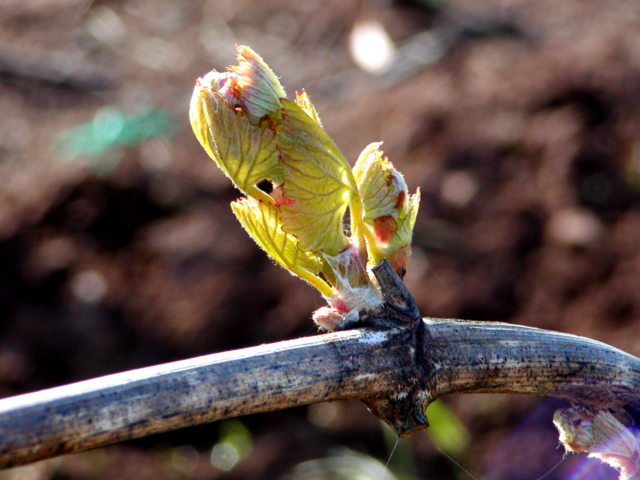 The idea of micro-crus began in the 12th Century, when Burgundian monks realized that small variations in soil, microclimate and vineyard orientation created major differences in wine style and quality. The French word for this phenomenon is “terroir.” At Domaine Serene we are dedicated to terroir transparency as a core principle. We not only track hundreds of micro-sites or “crus” throughout the winemaking process, but have also learned how specific techniques can optimize the unique qualities of each. During fermentation, these individualized approaches include temperature management, yeast management and fruit handling. After harvest, Chardonnay goes immediately into a press that was specifically designed for top quality white wines and Champagne production. After pressing, the wine is transferred to closed-top tanks, where it is allowed to settle for a short time before being moved into French oak barrels for fermentation. Multiple yeast strains, chosen specifically for Chardonnay, add nuances of flavor that combine with soil-driven characteristics to provide diversity and complexity for the blending process. While our Chardonnay barrel-ferments, we can move individual barrels between several rooms at varying temperatures to accelerate or temper fermentation as needed. The Pinot Noir varietal is notoriously more complicated. The fruit is first allowed to “cold soak” for about a week before fermentation is started. During this phase, at Domaine Serene we typically use dry ice layered throughout the fruit to keep it cool and prevent oxidation, a method Ken Evenstad is personally credited with pioneering in Oregon in the early 1990’s. After an extended aqueous extraction phase the Pinot Noir must is then inoculated with specific yeast strains and individualized punch-down strategies, selected to optimize extraction and desired terroir characteristics for each individual batch. 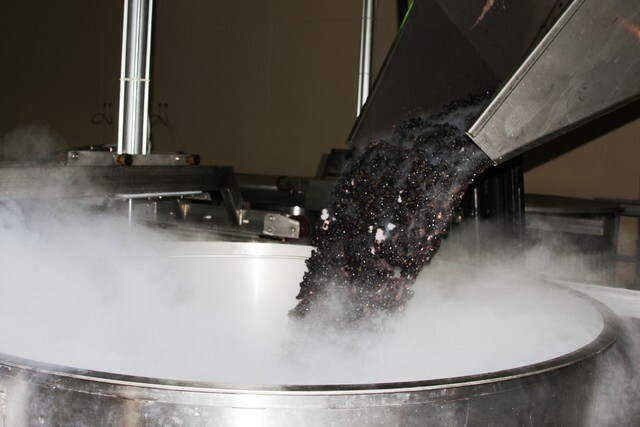 As fermentation gets underway, bins of Pinot Noir may be moved between cooler and warmer rooms to either slow down or speed up the metabolic process. All of our wines – Chardonnay, Pinot Noir and Sparkling – are exposed to different temperatures at various stages of fermentation. Eventually the fermenting red wine undergoes a customized pressing protocol, with a slow, precise and gentle press cycle that helps avoid harsh tannins while extracting flavor from the grape skins. Finally the pressed wine is transferred into closed top tanks for settling, before being gently transferred to barrel via gravity flow. Throughout all of these processes every batch is kept separate, and tanks of different dimensions are utilized to maximize quality potential for each of our up to 250+ micro-crus. Before racking our Pinot Noir to remove unwanted solids, we allow prolonged settling times in tank to promote maximum “clarity” of fruit flavor. Domaine Serene uses as many as 70 different barrel types from its fifteen different French coopers to fulfill our barrel needs. Every single barrel of wine – more than one thousand in most vintages – is tracked individually in a database by fruit source and harvest date, and by the age, size, forest-source and toast level of the barrel itself. Benefitting from decades of experience, our winemaking team has learned to pair certain cooperages and oak types with specific vineyard blocks to entice the best out of the wine. At Domaine Serene we ferment as well as age our Chardonnay in French oak barrels, and move the fermenting wine between cooler and warmer rooms depending on the stage of fermentation in a given barrel. Yeast variation and its influence on our white wines is carefully tracked: some yeasts enhance floral aromatics while some give more tropical fruit characteristics, and others are more austere or provide mid-palate weight. While we use a significant amount of new oak barrels to build complexity and depth in our wines, the goal is always to achieve a harmonious balance between the wine’s fruit flavors and oak influence. Our three large barrel rooms allow ample space for aging more than one vintage at a time, a luxury most wineries cannot afford. Domaine Serene wines typically spend 14 to 18 months in barrel. 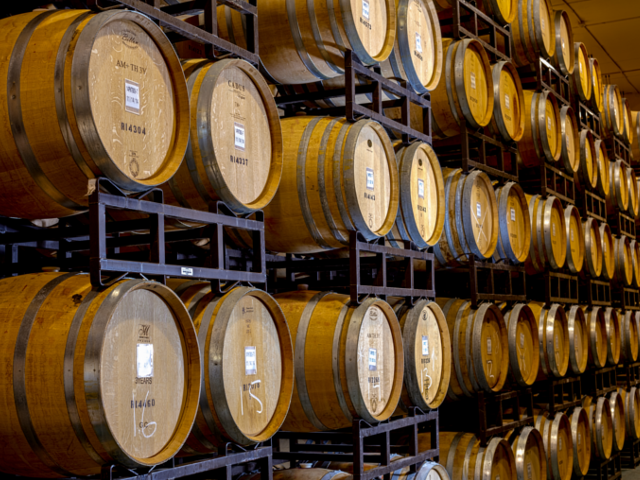 Each barrel room is carefully monitored to maintain ideal levels of humidity, temperature and air circulation. 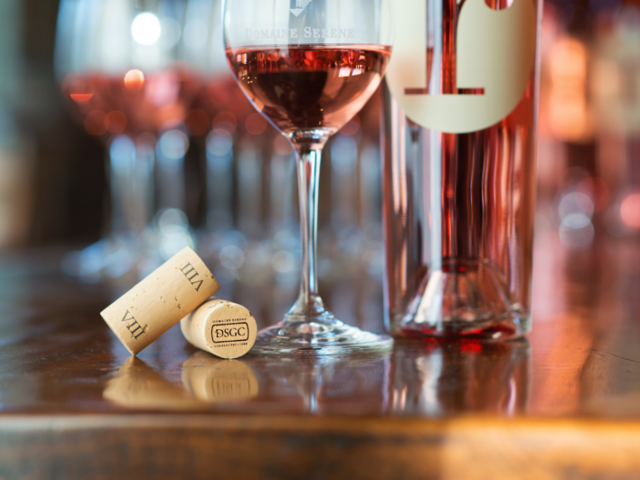 Tasting and blending exercises are painstakingly conducted throughout the year to arrive at ideal blends. Both Grace and Ken Evenstad are hands-on participants and leading members of the winemaking team. At this point in the winemaking process, the many layers of potential complexity generated during various earlier stages provide a rich palette of flavor, texture and aroma elements from which our master blenders can choose. These elements include terroir aspects from up to 250 micro-crus, variations in batch and tank management, yeast selection and oak regime. While most wineries can determine a blend in one day, or even a few hours, the blending process at Domaine Serene can take in excess of one year. This painstaking approach is critical to fully understand the complex interactions between multiple components and their role in the final blend. Finally, once the master blends have been created and the wine is ready to move into bottle, our in-house bottling line gives us complete flexibility to produce small or large batches of wine at just the right moment. All wine ages in two ways: aerobically (with oxygen) while it is fermenting, being pressed, racked and prepared for bottling, and anaerobically after bottling. The myriad of subtle chemical changes that occur after bottling and away from the air are critical for developing true bouquet and flavor complexity. This requires a certain amount of time, different from wine to wine, and allows the many different components in a given bottling to stabilize and fully integrate. Extra bottle age at the winery contributes smoothness and the development of an infinite range of aromatic nuances in a young wine before we offer it to our customers. Understandably, after investing so much care into creating a great bottle of Domaine Serene wine, we want to do everything possible to ensure our wines retain their exquisite quality and mature gracefully over time. To this end, our new “DSGC” program (Domaine Serene Guaranteed Cork) reflects the Evenstads’ commitment a zero-tolerance policy on cork taint, beginning with the 2014 vintage. A clean natural cork allows just the right amount of oxygen to slowly pass into the bottle over time, softening tannins gently and continually adding complexity throughout many years of bottle aging. Domaine Serene utilizes a collaborative and talented team of winemakers and executives, lead by Domaine Serene Founders, Grace and Ken Evenstad. Diversity and breadth of experience are key factors that characterize and differentiate the Domaine Serene winemaking team. While great wines begin with great vineyards, no detail is left unexplored throughout the winemaking process in order to enhance quality potential. An artful approach to blending world-class components is at the center of the Domaine Serene winemaking philosophy. The blending process can take up to a year as blends are conceptualized, built and continually re-evaluated. This meticulous process is essential to ensure that the right components are chosen in the ideal proportions to maximize complexity and consistency vintage to vintage. Each blend is finally evaluated blind by Grace and Ken Evenstad and the winemakers to eliminate bias from the final selection of the blend, ensuring that quality always prevails. Most industry experts agree that about five per cent of all wines sealed with natural cork closures display a musty taint. These wines are typically characterized as “corked.” Domaine Serene has developed a zero-tolerance policy against TCA and other forms of cork taint, beginning with the 2014 vintage. Our DSGC assurance guarantees taint-free natural cork closures to our customers, regardless of where or when the wine is consumed. Already applauded by wine critics like Harvey Steiman of the Wine Spectator, DSGC is another example of unwavering quality commitment by winery founders Grace and Ken Evenstad, who envision the program as an outright refusal to tolerate corked wine under their Domaine Serene and Château de la Crée labels going forward.